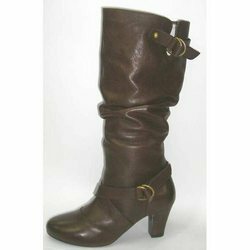 We are a reliable manufacturer, exporter, retailer and wholesaler of an extensive range of Ladies Knee Boots. These are acknowledged among the clients for its enthralling designs and colours. The product range offered by us includes Long Boot and Coloured Leather Boots. Maven Impex are specialized in manufacturing and supplying a quality range of Long Boot that are highly demanded among the fashion lover girls of all age group. These are fabricated using high quality material that is procured from certified vendors of the market and complying with international quality standards. We offer these at competitive prices to our clients. Looking for Ladies Knee Boots ?